It’s generally better to photograph old documents than scan them, because the camera can have a better depth of field, coping with documents that aren’t flat, and can also be used with documents that are far too large or fragile to feed through a scanner. Because both ink and paper are faded, it helps to increase the contrast of the image, with a program such as Photoshop, before publishing it. This works well, but exaggerates any tiny gradient of lighting or colour across the object. Getting the lighting very even, with no shadows, is very important. The other worry about light is the direction it arrives from. Strongly directional light makes changes in glossiness of a document, or slight crinkles in the surface, show up in the image. For best results, light should arrive from all directions. I (Emrys Williams) use the arrangement in the photo at right to shoot old documents for publication. The document is laid as flat as practical on a table. A tripod hangs from the ceiling. (This is our dining room. 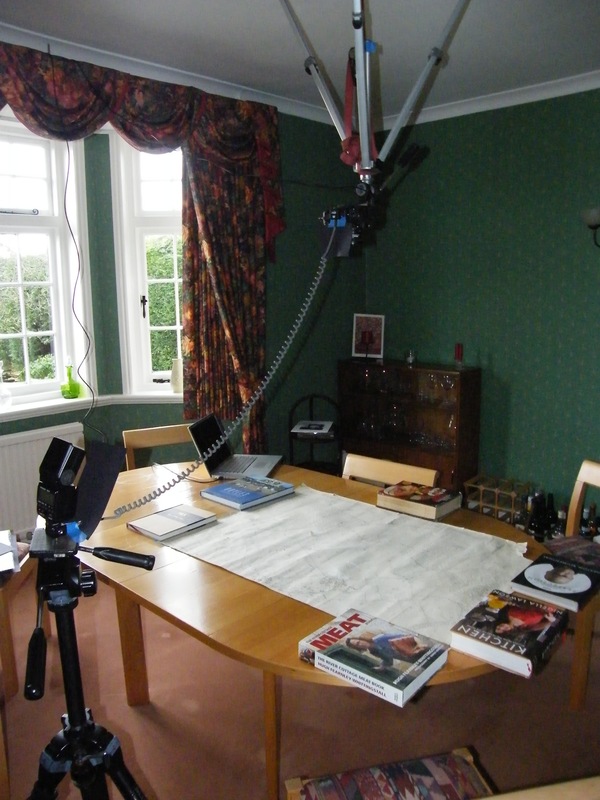 A ratchet load strap, to the hook that usually holds up a chandelier, pulls the tripod tight to the ceiling. The cookbooks hold the document flat!) The camera mounts on the tripod pointing vertically down. A flashgun is mounted on a separate tripod and points up at the ceiling, projecting light over a wide area centred above the camera. Having the tripod upside down keeps it all far away from the object, and it doesn’t cast shadows. The flashgun doesn’t illuminate the object, it illuminates the ceiling, and the reflected light from the ceiling hits the object from all directions. Black paper masks stop any direct light from the flash hitting the object or entering the camera lens. I use a 20mm F/2.8 lens stopped down to F/11, which seems to give excellent sharpness. My camera body is a Nikon D7000. I set everything on the camera to fully manual – focus, aperture (F/11), speed (1/250), ISO (800), WB (flash), and set the flash to manual too, and adjust the flash output for a proper exposure. I increase the sharpening applied to the images to create jpegs for the web, which helps read small print. I shot the whole 1:2500 map, which is somewhat bigger than A1 size, as a single 16Mpixel image. I did try shooting it in 9 smaller portions and stitching them together into a very high resolution image, but the stitching algorithm in photoshop isn’t good enough , and anyway the resulting jpeg is unwieldy for the web. The day after all this fooling about, I worked out that I can set up the D7000 to produce two files for each shot. One is the raw image, about 25Mbytes, and the other is a jpeg, contrast-enhanced, monochrome and highly sharpened. The camera actually does a very good job of producing readable documents all on its own, and I have the raw file to fall back on. Speaking of raw files, does anyone have anything good to say about Adobe Lightroom? When the camera creates both raw and jpeg versions of the same image, Lightroom, connected directly to the camera, imports only the raw one. Picasa for free seems to do a better job that Lightroom for £150!